This circuit DACT0009 is similar to DACT0008 but gains of upto 100 can be realized in this configuration, this is useful for signal conditioning of low mV outputs of transducers. The gain selection resistors R3 to R6 can be selected by the user and can be anywhere from 1K to 1M and can also be trimpots for obtaining gains as required by user, the resistor values shown are for decade gains e.g. for an auto ranging DPM. R1 and C1 reduce ripple in input and also snubs transients, ZD1 and ZD2 Zeners clamp input to +/- 4.7V the input current is limited by R1 lastly C1 and C2 are decoupling capacitors. The OpAmp U3 is used to increase the input impedance so that very low mV inputs are not loaded on measurement, the user can terminate the inputs with a resistor of his choice like 10M or 1M to avoid floating of the inputs when no measurement is being made. U5 is used as an Inverting buffer to restore polarity of the input and U4 is used as a buffer on the output of 4052 because loading it by resistance of value less than 1M will cause an error. An alternative is use R7 = R8 =1M and remove U4 but this may not be ideal. Gains of greeter than 100 may not be practical because at 100 gain itself a 100uV offset will be around 10mV at the output (100uV*100) this can be trimmed using the offset null option in the OP07, connect a trimpot between 1 and 8 and connect wiper to +5. For better performance use ICL7650 ( not pin compatible ) instead of OP07 and use +/- 7.5V instead of +/-5V supply. Eight steps for gain or attenuation can be added by using two 4051 and by using Pin 6 Inhibit on 4051/52 limitless steps can be added by cascading many 4051,52,53 as Pin 6 works like a chip select. 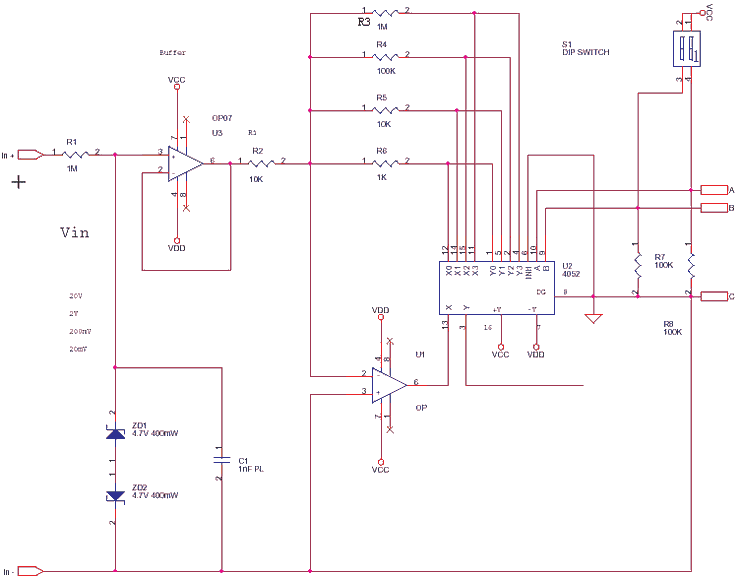 Some extended applications of this circuits are....... Error correction in Transducer amplifiers by correcting gain. Auto ranging in DMM. Sensor selection or Input type selection in Process control. Digitally Preset power supplies or electronic loads. Programmable Precision mV or mA sources. PC or uC or uP based instruments. Data loggers and Scanners.